How to get there: Alvdal is the best starting point. Alvdal is along Hwy. 3 that runs in Østerdalen from Elverum to Tynset. Drive north from the Tronsvangen intersection in Alvdal and make a right on the side road with signs for Trondsvangen. As you get to Trondsvangen you wil find parking on your right. Route description: From the parking, continue up the road towards Tronden, ignore any signs that may point you in different directions. The road passes several buildings (part of Trondsvangen), turns right and subsequently left. Further ahead there is a disinct Y-shaped fork of the road, continue for about 100 meter along the road going to Tronden, this is the left fork. You will now have a distinct ridge right in front of you. The road climbs on the right side of this ridge, while a clear trail heads straight up the ridge. Take this trail and follow it until it ends on the left side of the ridge considerably higher on the mountain. Continue across gentle, open landscape on the left side of the local summit on your right. Shortly, you will regain the road. Follow the road, going left. The road will make several switchbacks before topping out at the very summit. There is a large TV antenna on the top, the highest rock point is behind this tower. Comments: I did this hike with my friend Arnt Flatmo. We were misdirected by a sign on Trondsvangen and hiked the peak on the left side of the main drainage that comes down to Trondsvangen. We had rain and fog and eventually climbed the summit point from the opposite side of what is described above. The hike is about two hours going up and one hour for the return. 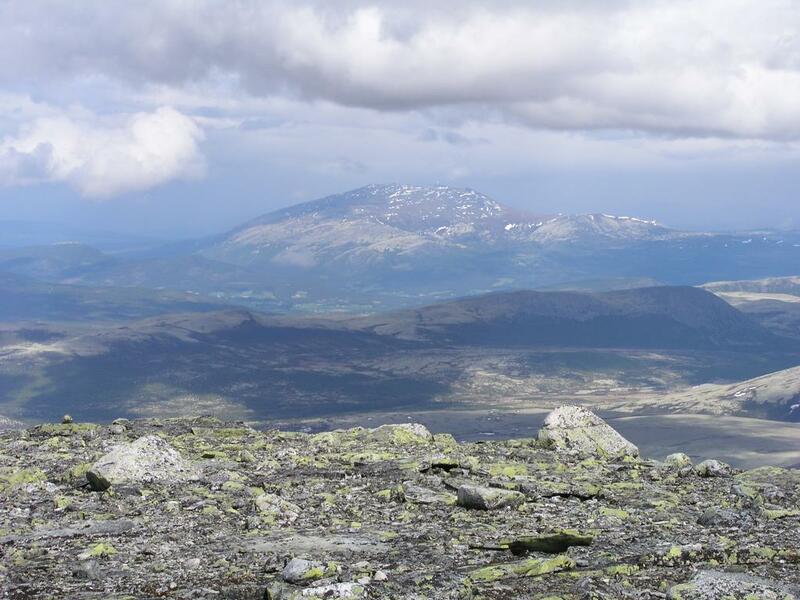 Tronden, as seen from the summit of Storsønkletten.